On the sandy banks of the Mekong River, local fisherman Mana Suttawong stitches together the ropes on a worn-out net, his hands chafed from years of pulling in hefty catches on the legendary waterway. But the days of big hauls are gone for the 54-year-old, and the downsized fishing nets are a telling sign of diminished supplies. "In the past we used 16 centimeters and 14 centimeters, but now we only use 10," Suttawong explained, referring to the size of the squared stitching in the net. Water levels vary along the river because of the chain of seven hydropower dams along the Mekong, controlled primarily in China. 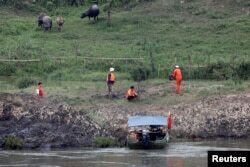 "In the next few days, the Chinese will release the water from their dams again and if the river floods, we will not have fish to catch and they will disappear," Suttawong said. A surge in demand for electricity from China and its South East Asia neighbors has altered the river landscape. 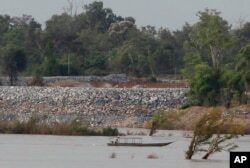 FILE - A fishing boat on the Mekong River passes near a construction site of the Don Sahong dam, near Cambodia-Laos borders, in Preah Romkel village, Stung Treng province, northeast of Phnom Penh, Cambodia, June 20, 2016. Now, an economic plan could deliver even more damage to an already fragile ecosystem that helps support some 284 million people relying on the river and its tributaries for their livelihood, primarily through fishing and farming. China's Belt and Road Initiative promises to improve regional trade routes including the expansion of the Mekong, using explosives to blast the rocks and sandbars along a 1.6 kilometer stretch to make way for large 500-ton Chinese riverboats. Environmental protests put the plan on hold last year, but despite evidence of impending harm to fish breeding grounds and farmland, many of the activists fear the expansion will proceed. "The biggest problem from the dam is the unusual level of the water and its impact on the ecosystem," said Niwat Roikaew, Founder of Rak Chiang Kong environment group. "The second issue is the sediment," Roikaew added, saying that rich organisms get trapped in the dam system, disrupting the river's biodiversity. But China is adamant the benefits outweigh the drawbacks. FILE - A Chinese team of geologists surveys the Mekong River banks, at the Laos side, at the border between Laos and Thailand, April 23, 2017. "I understand that when China and the Lancang-Mekong river basin countries start work on a cooperation project, attention is always paid to environmental assessments and care is taken to protect the local environment," said Geng Shuang, Chinese Foreign Ministry spokesman, during a recent Beijing news conference. "When implementing projects, local people are consulted for their opinions. All projects are carried out with the joint consent of China and the other relevant country," Shuang added. The environmental testing is a contentious issue, as critics point out the Thai government allows Chinese companies to complete their own research, a process some say is not entirely transparent. "We need to research for the positive and negative benefits first, but the Thai government just lets the Chinese survey for the geology, rocks, ecosystem and economic values first," Roikaew said. "If we talk about this in the technical term, the Chinese don't have enough information about this issue and it is the Chinese mistake," added Roikaew, who believes the focus of the move is purely economical. "The Chinese expand their economic power. This is part of their strategy to have control and power with One Belt, One Road." The environmental groups are not alone in this assumption. "I think the true goals of the river expansion are to create a Chinese global sway, which will facilitate greater Chinese commerce but also economic patronage for China over countries in South East Asia," said Paul Chambers, International Affairs advisor at Thailand's Naresuan University. Chambers views the move as an "economic neo-imperialist strategy." "We kind of see the commodification of sovereignty in SEA countries. This means that these countries are really losing their legal identity, and Thailand is one of these countries," he said. Despite opposition, some see the expansion as an inevitable development that has added benefits, including Sitthut Norasing, a local port manager in the riverside community of Chiang Kong. "Many people are concerned that if we make the river wider, the Chinese boats will pass by Chiang Saen and not stop and they go to buy the products somewhere else, but I think this is not true," he said. 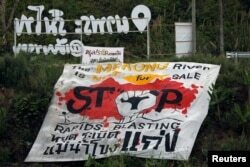 FILE - A protest banner demanding a stop to rapids blasting at the Mekong River is seen at the border between Laos and Thailand, April 24, 2017. "It's up to us whether the tourists are going to come to buy our stuff or not, and the world is a competition, so we have to compete with the others and make it better," the manager added. But the risks of doing business with China are many, said Chambers, including sovereignty and security issues. "The Chinese end up pushing more and more money for these projects, but they want the money back and they want interest and if you can't afford it then they want something tangible as an alternative," he said. "We can look at Sri Lanka, where the government ended up offering a 99-year lease on a port. Basically, China took part of Sri Lanka," added Chambers. Many critics, including Niwat Roikaew, see China as an aggressive power seeking to gain enormous hold over the region and add to their military bases in parts of Southeast Asia, like the Spratly Islands in the South China Sea. "Blasting the rapids project for the navigation is not just for navigating 500-ton trade boats only, but also bring security guard boats along to protect their trade boats," Roikawew said. As China increases its financial clout in the region with promises of benefits for all, many are wondering if the environmental impacts on the lives of those who live along the Mekong will be worth it. There are currently 11 proposed large hydropower dam sites on the Mekong River's lower mainstream and 120 tributary dams that pose a threat to the ecological health and economic vitality of the region, according to a study released by the Mekong River Commission earlier this year. Bill Ide in Beijing contributed to this story.